​The best mats ​are made from silicone which ​is non slip ​or microfiber or fabric which ha​s a non slip backing. Silicone mats often have a slight raised rim around the top to prevent food falling off the edge or to contain any liquid spills. They are able to ​be made like this because the mats are molded. In a hurry? Head straight to Recommendations (link in the Contents) for a quick summary of ​our current recommendations. Why Do You Need A Cat Feeding Mat? Does it Have To Be A Cat Feeding Mat? 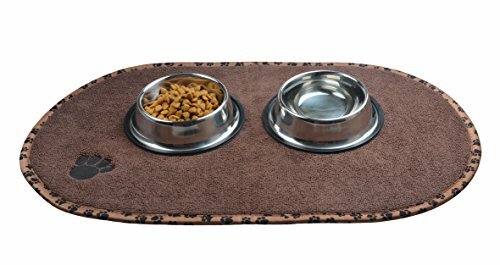 What Are You Looking For In A Cat Feeding Mat? What Are Cat Feeding Mats Made From? 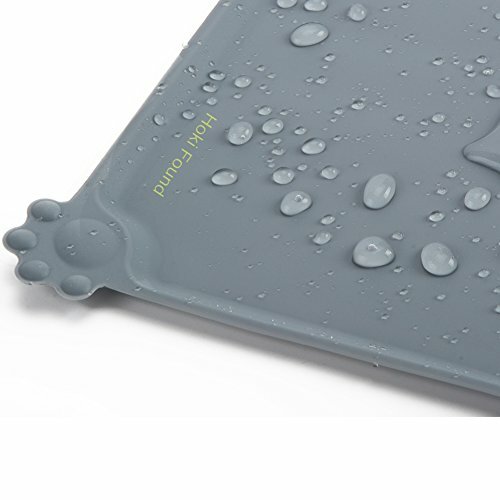 ​We have not always used​ a cat feeding mat. In retrospect, ​​I don't know why​ ​​as it so much easier keeping the cat's feeding area clean and tidy using a feeding mat. When using a cat feeding mat, bowls don’t slide across the floor. It is far easier to pick up and clean a feeding mat than getting down and cleaning the floor. Chunks of wet cat food that have hardened can be difficult to pick up and also get stuck to the floor surface. A cat feeding mat also protects the floor surface particularly if food bowls are always placed in the same location. This kitty has table manners! You can use any place mat which can be wiped clean or if you do chose fabric, ensure it can be machine washed. A hard plastic mat may be easy to wipe clean but will ​skid around the floor. Clearly that is not going to work. I like the anti-skid, water resistant bottom layer of the mat we are using at the moment as it means it stays in place and there is no chasing the bowl. Another option is to use a disposable place mat. There are times when they ​are useful, ​for example when someone else is caring for your cat for a period of time. It ​makes life ​easier for the carer and when someone is doing a favor, ​ it's nice to make the chore as easy as possible. It needs to be non slip. The dimensions - will it easily fit the space so that no one will be tripping over the mat and it is easy to get to for the cat? The material used in the mat's construction. Feeding mats are mostly silicone or microfiber or synthetic fabric. 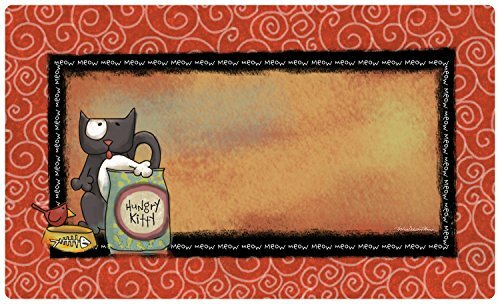 Colors - This may or may not be important to you however there is a huge choice of mats, super bright colors and neutrals plus mats with funny kitty cat sayings. The photos below show the mat we are using. It has been machine washed or spot cleaned ​many, many, many times and still looks good. It doesn't skid at all, possibly because one cat is using the mat. The first photo of the mat shows two medium size bowls placed side by side. Our cat loves his mat so much that he is partial to having a little snooze on the mat. Maybe he is hoping the the empty bowl will be magically filled while he is asleep. I think the cat has FOMO. Kitty having a nap on his feeding mat. Cat feeding mats or pet feeding mats for that matter fall into two categories. There are mats made from silicone which are non slip and mats made from microfiber or fabric which have a non slip backing. Both types work well, it is largely a matter of practicality of space and personal preference in design. ​We have reviewed both types of mats. One very good design feature of silicone mats is the rim around the edge. The rim on the silicone mats keeps all of the food contained on the mat which is helpful when cleaning the area. 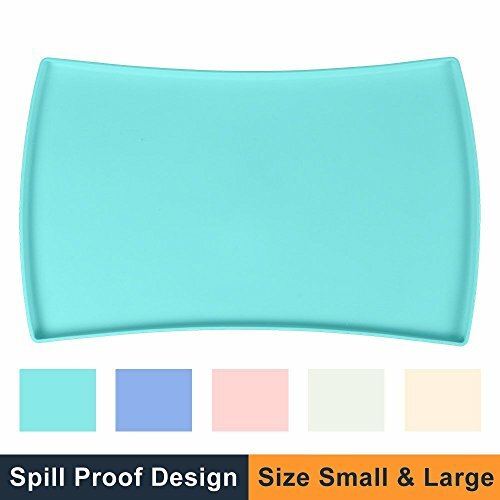 This silicone mat has evenly spaced, slightly raised bumps on the top of the mat and underneath and to further prevent the mat from sliding around. Small measures 8 x 12 x 0.4 inches. Large measures 24 x 16 x 0.4 inches. Extra Large measures 34 x 23 x 1.5 inches. The color choices are beige for the small mat, blue for the large mat and gray for the extra large mat. It has a raised outer lip to prevent food and liquid from sliding over the edge. The material is flexible and easy to wipe clean or put into the sink to wash. It is also dishwasher safe. Even with neat and tidy cat eaters, constant spills onto wood floors can do damage over time. Good for you if really need the versatility of three different sized mats to choose from. The extra large mat is very large. The convenience of easy cleaning, that is washing in the sink or by cloth or wiping with a paper towel or putting in the top rack of the dishwasher. You want a clean simple design with no logos or design on the mat. If you are looking for a long lasting mat and want to protect hardwood floors. You are looking for a mat that really does adhere to the floor. This mat comes in two different sizes 19 x 11.8 x 0.6 and 24 x 16 x 0.6 inches. It is made from silicone, rolls up, can go in the dishwasher or be wiped clean. The silicone is 100% food grade and non toxic and free from any odors. It is non slip and has high edges to keep all food and water on the mat. If your flooring is laminate, hardwood or carpeted, the flooring underneath will stay dry. There is a money back guarantee. If your cat is a messy eater this is an easy mat to clean. If your cat is elderly and eating habits are less than perfect, that is stray bits of food are flung around. You have more than one cat and need the larger size. You want a choice of colors. You want matching non slip bowls which are available. Note: The mat probably works best with​ food bowls that have a non slip edge, usually a rubber strip attached to the bottom edge of the bowl. Alternatively purchase the bowls that are made to accompany this product and are available in the same colors as the mat. This mat is FDA approved silicone and is non toxic and non allergenic. It can be wiped or rinsed or put in the dishwasher. It has a raised outer edge to prevents spills and protect flooring. ​It has no odor which is a plus for cats as odors and cats do not go together. The mat works best with bowls that have a non slip edge. Many ​stainless steel bowls have a non slip edge. Good if you need to protect hardwood, laminate or carpeted areas. You are happy with a gray or black color choice. You like the cute little paw in the corner (well these small things do make us happy). You need the mat to stop slipping around on hard surfaces - Note comment above about bowls with non slip edges. It is perfect for putting under a water fountain and catching any stray drips. 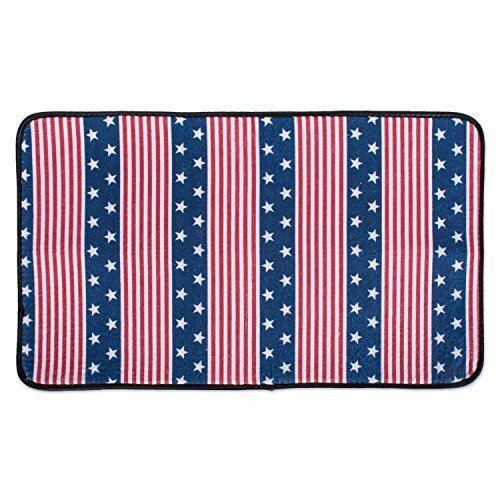 This mat measures 18.1" x ​13.4"
There are three color choices, red, gray and blue. This mat can ​be rolled up and can go in the top rack of the dishwasher. ​Note: If you decide to choose a mat that is plastic (not silicone) make sure you read reviews. Some plastic mats may have small feet on the underside that help to anchor it to one place on the floor. Ensure that ​the bowls ​re​main stable ​as it ​could be a nuisance if the bowls​ are still be able to be pushed around on the surface of the mat​. ​The Pet Fusion silicone mats hands down wins with the choices when it comes to sizes, having three different sizes, one of them ​an extra large size. It is FDA grade silicone, is anti microbial, non toxic and non allergenic. In addition it has a small lip around the edge to contain spills, can go in the top rack of the dishwasher and has small raised bumps on the surface to help keep bowls in place. For a standard size and a variety of colors to choose from, we highly recommend the silicone Cat Guru feeding mat. It is a tried and tested product, comes in different sizes and different colors. It is a similar product to Pet Fusion ​with less size options however more color options. It is useful to be ​able to roll this product for easy storing and it is an affordable price so buy two and that way one is always clean. ​The Hoki silicone mat​ now comes in four great colors, gray, black, teal and eggplant purple. ​Like the other silicone mats, it is easy to ​keep clean as it can be wiped down washed in the sink or dishwasher. It dries pretty much instantly. It can be rolled and is also suitable under water fountains to protect floor surfaces. 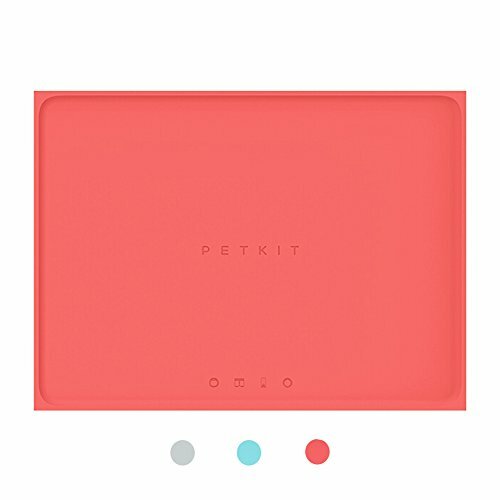 ​If you need a small silicone mat, the Just Pet Solutions cat feeding mat will fit into a small space and still have the same features as the other silicone mats. ​Note the edges are raised slightly so if your cat is likely to be splashing this is something to consider. ​Most of these microfiber mats have other design and color options which immediately become visible when the link on the images on this page are clicked. There ​are too many individual products to show on this page however you are still able to ​enlarge each design to ​see ​the detail when clicking on the link. This mat is a mixture of cotton and polyester. It has the necessary non skid rubber backing and measures 13" x 19". It is machine washable. The design shown is just one of several different designs all with unique sayings. It can absorb up to five times its weight in liquid and is made from recycled materials in the USA. There are eight unique designs. This mat measures 12 x 18 x 0.1 inches. It can be machine washed and dries quickly. The mat has a rubber backing. It is colorful, well made and absorbent. Other designs are available and the mat shown has matching bowls. Great for 4th of July. ​This is the exact mat that we have and is described in more detail near the beginning of this article. ​It measures 12.5 x 0.2 x 21.5 inches so is a generous size. They are commonly used for cats and dogs but there are actually three different size. ​The backing is anti-skid. It can be washed in the washing machine and placed in the dryer on low heat. ​It dries so quickly that I have never needed to put it in the dryer. 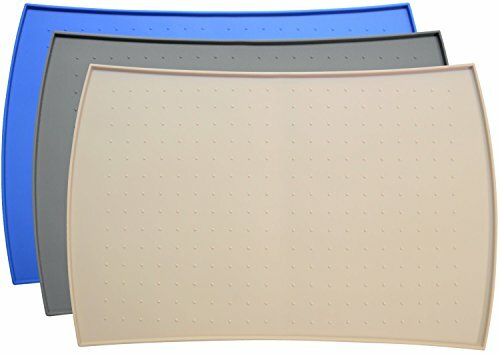 ​Whether you choose a silicone or microfiber mat is largely preference. The microfiber mats have more 'personality' regarding design choices. 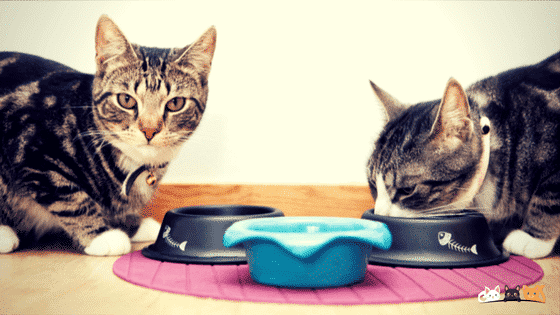 ​If you found find this​ article helpful you may also like to read about raised cat feeding bowls and why we eventually changed to using a raised feeding platform. ​The Best Thing About Using Raised Cat Bowls.